When you pick your bow tie you will be asked what “bow tie style” you would like. 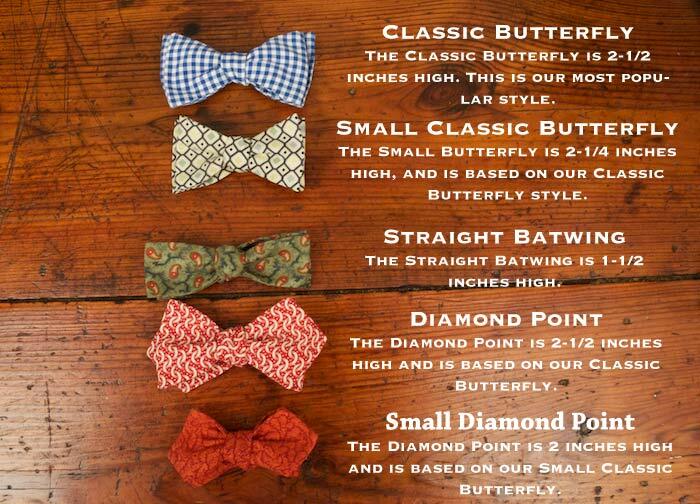 Are you not sure of the different bow tie styles that there are or what the different styles look like? Here you will find the the bow tie styles that we offer and what they look like. We offer a Classic Butterfly, Small Butterfly, Straight Batwing, Diamond Point, and Small Diamond Point. If you don’t see the bow tie style that you like contact us about having it made for you and who knows maybe we will add it to the bow tie styles we currently offer.